This winter has brought a lot of snow and blustery cold days this year. Between the dry indoor air and the frigid outdoor wind--my skin skin has really suffered. As I am staring down another birthday on the all-too-near--horizon--I am also battling a few (too many) new fine lines and wrinkles on my face and neck. Since I have become much more aware of the chemical risks of the products I use in my daily health and beauty routines--I try to limit exposures to some of the proven bad guys in my anti-wrinkle cream as well. 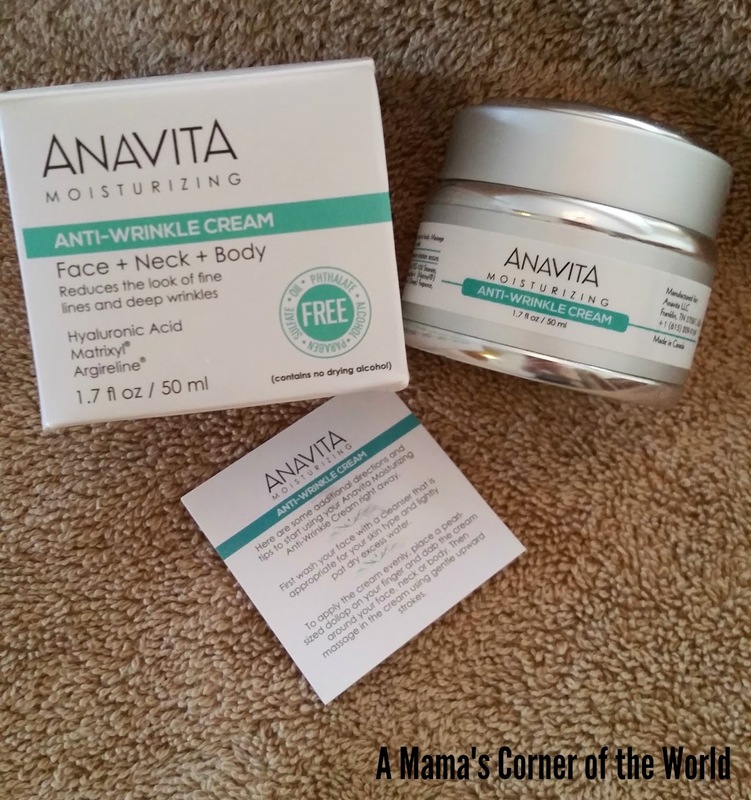 I was excited to try the Anavita Moisturing Anti-Wrinkle Cream recently--and I am even more excited to be able to offer my readers a discount and an opportunity to win a package of the Anavita Moisturizing Anti Wrinkle Cream as well! I received a full sized product sample for use in my review. All opinions and experiences are my own. 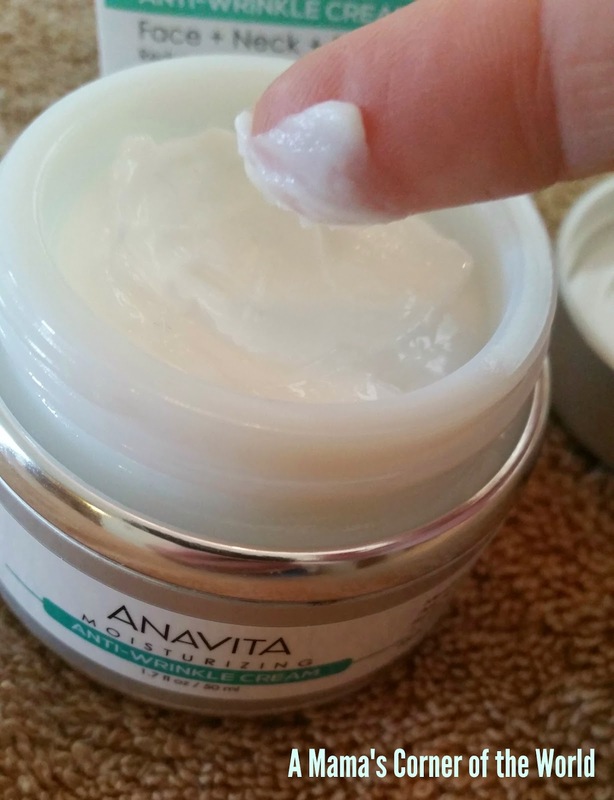 A little information about the Anavita Moisturizing Anti-Wrinkle Cream. Anavita Moisturizing Anti-Wrinkle Cream offers a unique skin care formula which stimulates collagen production and rebuilds the cellular matrix of the skin, reducing the appearance of fine lines and wrinkles, using three clinically proven ingredients - a super-absorbent form of hyaluronic acid, Argireline (5%), and Matrixyl . Anavita Moisturizing Anti-Wrinkle Cream is paraben free, sulfate free, phthalate free, oil free, alcohol free, and is not tested on animals. The product claims to be suitable for all skin types--and suitable for both daytime and nighttime use. 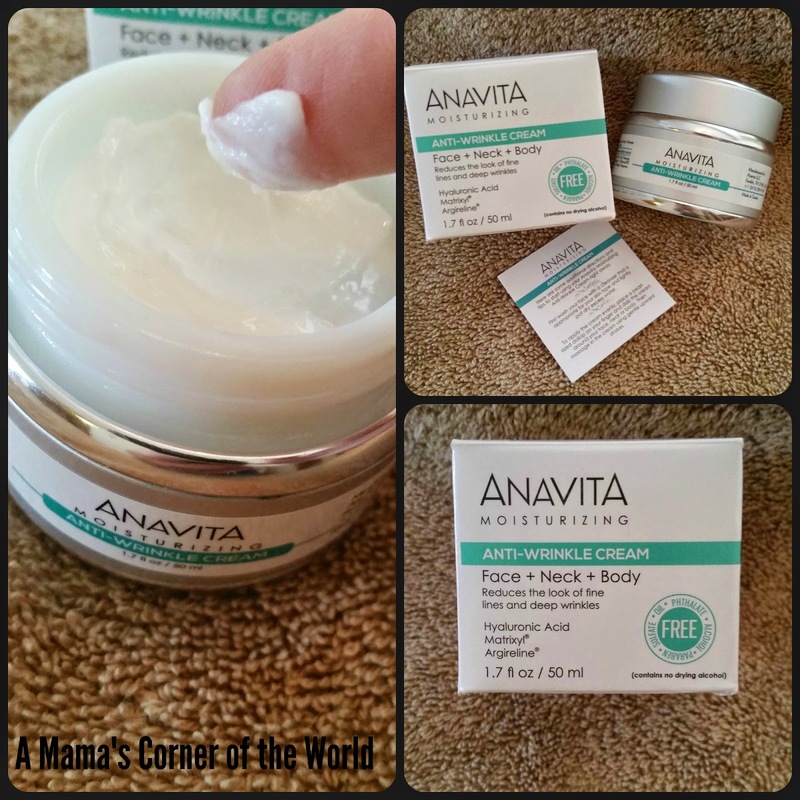 My experiences with Anavita Moisturizing Anti-Wrinkle Cream. I followed the package instructions and washed with my normal cleanser--and then applied the Anavita Moisturizing Anti-Wrinkle Cream. The cream has a light, almost medicinal scent--but, is not unpleasant and the scent fades quickly. I was most impressed by the texture of the cream. It is very thick and creamy--but, was not at all oily or heavy and it absorbed quickly and completely during application. There was no moisturizer residue to wash away from my hands--in fact I generally massaged any leftover cream from my fingertips onto the backs of my hands. Some moisturizing creams feel heavy and seal the skin so much that foundation and makeup seem to slip off . I loved the way the Anavita Moisturizing Anti-Wrinkle Cream absorbed and formed a nice base for my regular makeup products. The product claims that users may notice visible results in 2-4 weeks. After my first week, I do feel that my skin is better hydrated and softer and smoother to the touch. I have always had fairly sensitive skin; but have not suffered any skin irritation or breakouts from this product. Would I recommend Anavita Moisturizing Anti-Wrinkle Cream? I love the way the product absorbs and moisturizes. I look forward to visible results--and do plan to continue using this moisturizer as a day moisturizer. Unfortunately, I do have to add a sunscreen product as this moisturizer does not offer any sun protection. I am not quite ready to give up my nighttime moisturizer--but, may do just that if the visible results are clear in the upcoming weeks! I also like the fact that Anavita offers a 100% Satisfaction Guarantee on this product. Skin care product results vary so much from person to person. Products that work perfectly for me may cause skin irritation or little results in another. Receive $5 off a bottle of Anavita Moisturizing Anti-Wrinkle Cream when you purchase on Amazon.com. Enter coupon code: FEBBAC28 during Amazon checkout. Would you Like to Win a Bottle of Anavita Moisturizing Anti-Wrinkle Cream? Definitely trying to keep my skin moisturized. It seems every winter it just gets worse and worse! My biggest skin concern is how dry my skin gets in this super cold weather. My biggest concern is how dry my skin gets during the winter. My biggest concern this winter is my dry skin and another end to another year. My biggest skin care concern is my cracked fingers and flaky legs. I use vaseline for my hands and moisturizers for my legs. My skin is very dry, and I am concerned about that. Itchy skin and wrinkles are my biggest concerns! My biggest skin concern this winter is the dry skin. Winter skin is so itchy. My skin seems to be extra itchy this year. Ugh! I also worry about facial pores. My biggest skin care concern this season has definitely been dry skin and fine lines. I feel like not having moisturized skin could affect the dryness of your skin,too. My face is so dry it hurts! My skin gets extremely dry and itchy in the winter. I have dry skin during the winter. I need help with that. My biggest skin care concern this winter is dry skin. My biggest skin care concern this winter is my dry skin. Dry skin is hard for me in the winter. My biggest concern is i have winter time eczema! My skin gets very dry during the winter months. I have trouble keeping my skin hydrated very dry. It's been colder than usual and my skin has been extra dry. My biggest skin care concern is dry skin, especially on my feet. My skin seems to be getting drier and flakier by the day! Keeping my skin moisturized! Winter is a killer for that. The fine lines & wrinkles are getting deeper! My biggest concern it winter dry skin. for me, it is dry skin and fine lines. It is definitely dry skin! My biggest concern is the dryness. We have a wood stove and it just drys my skin right out. In the winter i have a hard time keeping my skin from getting dried out. My biggest concern in the winter is having both dry skin and oily areas at the same time.